Below is some older news before we introduced the new method of providing news. This is an Oral Online record of memories of people who experienced WW2, from all over the world. WarGen was founded by broadcaster and historian, Dan Snow, and author and broadcaster, James Holland. We’re a small team with big ambitions. We’re creating a crowd-sourced online repository of oral-history from the people who lived through World War 2 and we are asking you to help us. We are looking for individuals willing to join our volunteer team as interviewers and to go out into your local communities and record these important stories of a fast disappearing generation or to let us know if they have a family member or friend or even know of someone who they believe would like to have their stories recorded. Please check out the website for the interviews that have already been carried out the length and breadth of the country. If you wish to add your story or help please visit the WarGen website. How to use the NRO Searchroom. For absolute beginners, we will take you through the first steps to using the searchroom. Find out more about how the Drawing in the Archive exhibition was created. 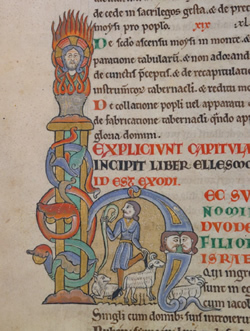 Join curator Clare Haynes for a walk-through of the main exhibits, discover how a medieval screen painting was conserved, and explore the programming of events. Our first creative writing workshop on the road. Using copies of some of our documents, local writer Abby Erwin will help you start your creative writing journey. Not forgetting our FREE half-term activities for children. £ 2 members, £3 non-members. Refreshments available. Not so very long ago, Norfolk was criss-crossed with railways so that it seemed as if every village and town had access to a nearby station. These lines not only provided essential services to many rural areas but also jobs and a way of life. The mania for building these railways began in the second half of the 19th Century and Norfolk’s geography with its generally flat landscape enabled rapid expansion. Sadly, this era is now but a fading memory although some evidence remains, usually in the form of original station buildings converted to private homes, goods and engine sheds, level crossings, bridges, cuttings and so on. Aerial photography will often define the routes of previous trackways. Richard Adderson’s knowledge of our local railway heritage is second to none. He has written several books and co-authored others. His extensive photographic archive of the Wells to Dereham line, which at one time was linked direct to London as well as King’s Lynn. 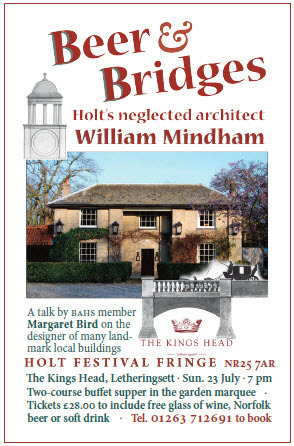 BAHS member, Margaret Bird, is giving a talk on William Mindham the designer of many landmark buildings locally. Two-course buffet supper in the garden marquee. Tickets £28.00 to include free glass of wine, Norfolk beer or soft drink. Tel. 01263 712691 to book. Mindham designed public houses, including the King’s Head at Letheringsett (1808), the malt-kilns and brewery tun room beside the pub (early 19th century), and the bridge over the Glaven (1818). He brought the Greek Architectural Revival to north Norfolk in 1809 with his Greek Doric portico at Letheringsett Hall, as well as designing Holt’s first two Wesleyan chapels and the original Foundry Bridge over the Wensum in Norwich (1810). Click here for more about Mindham’s career. Click here for more details of the Holt Festival. The ‘Friends of All Saints Church, Hemblington’ have asked us to inform members about a tour of three churches which each contains Medieval wall paintings, including the death of St Thomas at Canterbury, two versions of the Seven Acts of Mercy, and “the living and the dead” sequence. The tour will be led by the local Rural Dean, Rev’d Canon N. Garrard and refreshments will be offered at the end of the tour, all for £11 per person. The keynote speaker will be the distinguished historian, Professor Chris Dyer, whose theme will be ‘Local societies on the move: migration and social mobility in the middle ages’. Other speakers include Professor Geoff Timmins and Dr Alan Crosby on ‘Housing and local history: research agendas and practical issues’. The Annual General Meeting of BALH will be held at 12.30pm and will be chaired by Professor Caroline Barron, President of BALH, who will later be presenting the 2017 awards for research and publication, for a society newsletter, and for personal achievement in local history. For more information and to book your place online please click here. The Forum, Norwich, is appealing for the people of North Norfolk to share their stories and memories of relatives who fought in the Second Battle of Gaza, 17-19 April 1917 to mark its centenary in April. Hundreds of Norfolk men who served in The Norfolk Regiment fought in this battle, including many from North Norfolk and The Forum is keen to hear from local people who may have stories, photographs, letters and objects relating to the Second Battle of Gaza. Information and stories of local soldiers will help add to the research for The Forum’s community project ‘Norfolk in the First World War: Somme to Armistice’. The project honours Norfolk’s First World War heroes and runs until November 2018 with funding from the Heritage Lottery Fund (HLF). Local people with information on their connections to the Second Battle of Gaza are invited to get in touch with The Forum’s Learning Manager, Sarah Power via email or on 01603 727977. All of the research and learning from the project will culminate in a Battle of Gaza exhibition starting at The Forum and the Norfolk & Norwich Millennium Library on 18 April 2017. Following this, the exhibition and an accompanying film will go on tour to schools and community venues around the county. We will be holding two talks at The Forum on the Battle of Gaza on the evening of Wednesday 19th April which your members may be interested in. Find out about successful HLF applications, BBC Voices, and much more. The fee also includes a one-day photography permit which is worth £10.50 and lunch. Call 01603 2225999 or click here. The workshop is being held as part of the national First World War Memorials Programme. Don’t miss your chance to find out how to assess the condition of your local war memorials, obtain funding for their repair and make a positive difference to an important part of your local heritage. The project covers war memorials of all types and volunteers are needed to record those that are in good as well as poor condition. Two of the extraordinary Pentney brooches will be on display at the Lynn Museum. This special display features two of the Pentney brooches on loan from the British Museum. These silver brooches were found in 1977 when a grave was being dug in Pentney churchyard, ten miles outside King’s Lynn. Six brooches were found and two are to be displayed here. At the time, neither their age nor value were recognised and they were left in the church parish chest. A few years later the brooches were brought into Norwich Castle Museum where they were identified as dating from the Anglo-Saxon period and of great rarity and archaeological importance. During the Anglo-Saxon period brooches like these were worn to fasten clothing. All the Pentney brooches have cruciform designs, although the cross is more obvious in some than others. The display will open to the public on Tuesday 10th January and run through to the end of February. Our colleague Dr. Tim Pestell will be giving a talk about the brooches and the period in the museum on the 8th February. His subject will be ‘Anglo-Saxon East Anglia and the Pentney Hoard’. East Anglia was one of the wealthiest regions of England in the Anglo-Saxon period, which makes it easier to understand why such a fabulous hoard of jewellery like the Pentney brooches was buried here. Dr. Pestell’s talk will look at why the region was so rich and why the hoard may have been buried. The Museum is open Tuesday to Saturday 10 – 5 and admission is free. The museum hopes that people can come to Lynn to see the brooches, and we would be fascinated to hear if anyone remembers their discovery. On Friday 28th October we will be hosting another talk with slides by local historian Philip West covering memories of Blakeney, Wiveton and Cley. 7.30pm start. Philip’s talks are entertaining and fascinating, and it’s also an opportunity to see lots of slides of this area in the past. Accompanied by Wiveton’s Janet Harcourt and Godfrey Sayers and from Cley Richard Newton, all of whom have years of knowledge of the history of the local area, characters and events –they will be regaling us with facts and tales from the past. Do you know whether your house was used as a poor house or was it a local shop? Come along and bring your own memories and knowledge to participate in an evening of nostalgia. £ 5 including a glass of wine/soft drink at the interval (pay on the night), raffle. Booking advisable, tickets available on the door, please reply by email or phone Michelle on 01263 711585. The Record Office is working with a recently established charity, the Norfolk Archives and Heritage Development Foundation (NORAH), to raise funds in support of this appeal. If you are able to help us by donating money to NORAH you will be helping to secure these important historical records for generations to come. To thank those who have helped us, we will be holding a special event at the Record Office where items purchased in the sale will be on display. If you would like to discuss this in more detail please get in touch with me at the Record Office; whatever help you can give would be most appreciated. It has been proposed that Norfolk County Council withdraw funding from finds identification and recording service from next April (2016). This would leave posts funded solely by the Portable Antiquities Scheme: A Finds Liaison Officer, a Data Input Assistant (half-time) and a numismatist (half funded by the portable antiquities scheme). So in affect 4.5 posts would be reduced by 2.5 to 2 posts. Baron Robert Fitzwalter had a very colourful life including playing a significant role in the actions leading to the drafting of Magna Carta. For many years he was also Lord of the Manor of Binham and Patron of the Priory. During this time he was much involved with events which would have influenced his increasingly fractious relationship with King John. In his later years he initiated the building of our great West Front, completing the Priory Church in spectacular fashion. It is so appropriate that this evening, which promises a fascinating insight into a significant time of our history, should be jointly hosted by the Friends of Binham Priory and the Binham Local History Group in Binham Priory. The BAHS is a member of the British Association of Local History (BALH). Below is a link to their website and their most recent newsletter. Battle of Agincourt to be given by Dr Juliet Barker at South Creake at 7.00pm on Friday 4 September 2015. We understand both lectures are free. Norfolk Record Office are holding an event on Thursday, 4 June between 5pm to 6:30pm. The event will include a talk on how to trace your criminal ancestors. On Thursday19th March at the Annual Parish Meeting in Blakeney Village Hall, Pam Peake accepted a cheque from the Parish Council Community Fund on behalf of the History Centre. Pam explained that the donation will be used towards a presentation case for the Hettie lifeboat model and that this means we are closer to our goal of having the Hettie lifeboat on display in St. Nicholas Church in front of its service board. After accepting the cheque Pam gave an interesting talk about the men from Blakeney who fought in WW1 and that five names are missing from the Memorial in New Road. The History Centre also had a presentation in the Village Hall and a handout on The Great War 1914-18 about 25th April Anzac Day and Anzac biscuits. Click here to see handout. Great Yarmouth Local History & Archaeological Society is holding this event. The study day will be followed by the unveiling of a ‘blue plaque’ on the Custom House on South Quay. 2015 is 675th anniversary of this battle in which Yarmouth men and ships were heavily involved and as Great Yarmouth Local History & Archaeological Society felt that few people knew of the events that happened all those years ago we should do our best to educate those who might be interested. This project expanded greatly and led on to the organizing of our Study Day and we have gained the services of three very distinguished historians who have agreed to speak at St George’s Theatre on 27th June this year. Please note the writing on the above programme describing Dr. Craig Lambert should read “Senior Lecturer Southampton Marine and Maritime Institute”. Professor Bailey also advises me that research since Professor Hoskins wrote his excellent book ‘Local History in England’ (Longman 1959) details of Yarmouth has updated his research as follows:- In the 1334 Lay Subsidy Yarmouth’s tax charge placed it 7th in the rank order of English towns (no need to cite Hoskins for this, which is now long outdated on this point, though not on many others! ), and the number of taxpayers in the first Poll Tax of 1377 placed it 19th…already in decline! Windsor Castle the oldest inhabited castle in the world, and home of Her Majesty Queen Elizabeth II. Eton College founded by King Henry VI, one of the world’s most famous schools with a rich history and alumni. Magna Carta and J.F. Kennedy memorials at Runnymede the focal point of events in 2015 to mark the 800th anniversary of the signing of the Magna Carta. The Savill Garden one of the country’s finest ornamental gardens, situated in Windsor Great Park. To guide visitors through their stay, the four day event will also include talks by William Shawcross (official biographer of Her Majesty Queen Elizabeth, The Queen Mother), Hugo Vickers, (writer, broadcaster and royal historian) Lady Jane Roberts, (former Royal Librarian and Keeper of the Print Room at Windsor Castle) and Mark Flanagan (Keeper of the Gardens, Windsor Great Park). Situated in the heart of Windsor Great Park, Cumberland Lodge is a former royal residence, and has been the home of an educational foundation since 1947 by kind permission of the monarch. The foundation arrangers conferences, retreats, lectures and other educational activities, and is renowned for its ‘English country house’ hospitality. The four day residential retreat costs £595 per room (shared accommodation) or £450 per person (single occupancy). We would be delighted if members of The Blakeney Area Historical Society (BAHS) could join us for this event and would be grateful if you could circulate this to your members. If you would like printed copies of the leaflet or have any questions, please do not hesitate to get in touch. We look forward to welcoming you to the Lodge. The British Association for Local History is holding this event. From Peter Trudgill, EDP, Monday 13th October 2014 using the excellent Glaven Historian as a source for the article. 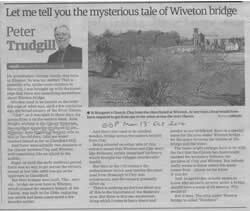 Click here to read what is on Wiveton Parish Council’s website. This course is being run by Mary Fewster at Wells WEA, weekly for seven Tuesdays from 30th September, 10.30 – 12.30, at the Friends Meeting House, Church Street, Wells. ‘The Company of Preachers‘ looks at the social history and impact of preachers, new religious movements and their buildings in Norfolk and East Anglia from the Reformation until the beginning of 20th Century. The fee for seven weeks is £45. On Saturday 6th September a pleasant walk exploring the Merchant houses in Blakeney was led by Pam Peake. Around 18 members and guests were escorted around the gardens and outsides of two Merchant houses that were built and further enhanced by the Brereton, Page and Turner families. The walk focussed on the evolution of the Merchant House once part of the Page and Turner estates but also took in other houses and the Methodist Chapel in the High Street. A retrospective view of the north Norfolk Coast on Friday 24th October at 7.30pm in Wiveton Parish Room. The talk is by local historian Philip West. 7pm for a 7:30 start. Glass of wine/soft drink & Raffle. Invitation to a Presentation about this project on Tuesday 16th September at 7.30pm in Binham Memorial Hall. A new Binham Priory Conservation and Community Project needs your help. Binham Parochial Church Council and Friends of Binham Priory are working in partnership to submit a grant application to the Heritage Lottery Fund. This is to provide for long-term conservation; raise awareness of the heritage significance and involve people and the community to sustain Binham Priory for future generations. The project will conserve the west front and carry out repair works on the south and east elevations. Internally, it will repair cracks in the upper walling and replace the outdated electrical wiring system. To enable wider and increased use by the community, new work will be undertaken to improve and enhance the church building and pathways. This will include lighting of a performance space; improved heating and car parking arrangements. A programme of activities and events is being planned and the Project Team would like ideas to help put this together. What would you like to know more about? Do you have suggestions for workshops and day schools, for family events and children’s involvement? Please come to a Presentation on Tuesday 16th September at 7.30pm in Binham Memorial Hall to hear more about the project and how you – and local and wider communities – can be involved. Please let Pauline Scott know by 15th September, if you are attending. Part of the Holt Festival, Egypt Through The Artist’s Eye is open 11am to 5pm in the Meeting Room, St Andrew’s Church, Holt. A loan exhibition of paintings and ancient artefacts, including small works from some of the most important private collections ever put together, a very rare Tutankhamun piece, augmented by original film and rare recordings of Howard Carter, original drawings, the only existing bound, printed copy of his album of watercolours of birds and animals. Also including works by David Roberts, Edward Lear, Frederick Goodall and other important artists, together with travel diaries and ephemera never before exhibited. In the Special Lecture Series there is a lecture Howard Carter (1874-1939) Artist, Naturalist & Archaeologist on Thursday 24th 10.00am – 5.00pm at Old School Hall, Church Street, Holt. As part of the project, we will be running a number of training days for groups of volunteers in how to archaeologically record some of the remaining standing buildings at airfields. I was wondering if this is something your members might be interested in? The talk is about an hour. We have our own projector, laptop and screen. This talk can be run on any day of the week at any time depending on when you can fit us in. The hope is that volunteers will then be able to go away and start recording buildings on their own and we can collect the results and add them to the local Historic Environment Record and see how much of these airfields remain. 30 March 2014: The entry in April’s Glaven Valley Newsletter about the recent loss of Sheila Harvey mentioned that she appeared being interviewed in a 1961 film about the Blakeney Neighbourhood Housing Society (BNHS). Click here to see the archive film about the BNHS including an interview with Mrs Norah Clogstoun who founded the BNHS in 1946. Whilst on the East Anglian Film Archive website if you do a search for local places such as Blakeney or Cley you will other interesting film footage. Click here for information about the BNHS today and in the past. This fascinating talk by Juliet Webster was held on Tuesday, 17 December 2013 at the British Legion Harbour rooms to around fifty members and visitors. We were taken back in time on a two-week horse-dawn caravan holiday round Norfolk 100 years ago in pictures and poetry by Honor Elwes and her two intrepid lady companions. This interesting talk by Dr Sarah Spooner and Dr Jon Gregory of the UEA was held at the British Legion Harbour rooms to nearly sixty members and visitors. The magnificent art collection of Great Britain’s first Prime Minister, Sir Robert Walpole, sold to Catherine the Great to adorn the Hermitage in St. Petersburg, is reassembled in its spectacular original setting for the first time in over 200 years. This exhibition ran until 24 November 2013. Maritime History through Ship Graffiti, presentation model of the Hettie lifeboat; stories from the Churchyard, paintings, photographs and even more. Chris Barringer played a fundamental part in the formation of this Society. In 1990 he was invited to give a series of lectures in Blakeney and two more series followed in 1991 and 1992. An exceptional presentation model of Blakeney lifeboat the Hettie has returned to the village of Blakeney after being donated to the History Centre.